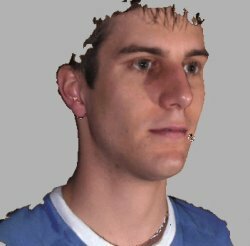 The ability to perform fast and accurate 3 dimensional reconstruction of an environment or object is central to many areas of computer vision processing. 3D face recognition, parts inspection, autonomous drivers and a near infinite number of other applications have driven research in 3D reconstruction forward for the last decade. Whilst much of the mathematics of image formation and 3D reconstruction have been comprehensively researched through photometry and multiple view geometry for many years it is only the recent exponential explosion of processing and graphics power that have allowed practical implementations of such work within computer science. Current research is at a stage where, whilst the majority of the basics have been well covered, many practical problems and implementation issues remain. A number of recent research projects have been focusing their attentions to the open-ended problem of generating realistic facial animations from 3D head models. Initially we discuss the motivation for researching automated facial animation methods. Secondly we investigate a variety of traditional and cutting edge approaches to the problem. In this paper we propose a novel 3D face recognition system. Furthermore we propose and discuss the development of a 3D reconstruction system designed specifically for the purpose of face recognition. The reconstruction subsystem utilises a capture rig comprising of six cameras to obtain two independent stereo pairs of the subject face during a structured light projection with the remaining two cameras obtaining texture data under normal lighting conditions. Whilst the most common approaches to 3D reconstruction use least square comparison of image intensity values, our system achieves dense point matching using Gabor Wavelets as the primary correspondence measure. Here’s a quick video flythrough of a reconstruction of my face. This scan was produced using hardware from 3DMD. The attached document is a summary of the work carried out in the first year of my Phd. Face recognition is one of the most important and rapidly advancing areas of computer science. Increased recent interest in improving commercial security systems has lead to intensive research into biometric identification and verification applications. Whilst a number of biometrics are potentially available for human recognition the face can usually be captured with the greatest degree of “passivity”, thus making it the most suitable choice for general security implementations. This report aims to describe the technical details behind the development of a 3D reconstruction system for face recognition. 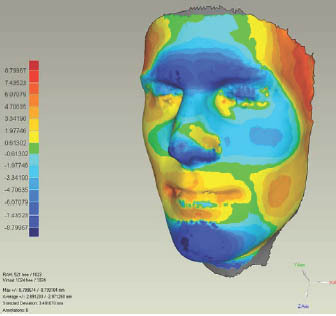 Initially the methods used for constructing a 3D model of the face from several cameras are discussed followed by some consideration of the pitfalls and problems behind some of the techniques.